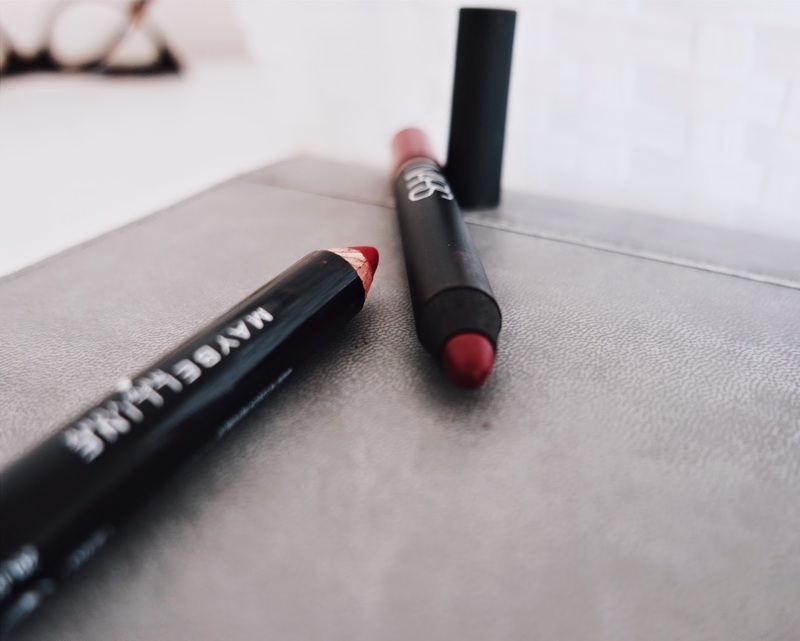 The Maybelline pencils are a little smaller and shorter in shape and size compared to the Nars ones, and are also made from wood whereas the Nars packaging is a plastic-like material. Maybelline's pencil's come in at £4.99 each, which is a pretty good bargain. They have good colour pay off and can be used both as a lip stick or simply to line your lips. However, compared to the Nars pencils, they are a lot drier in texture and tend to drag. I find that this really dehydrates my lips leaving them flaky. Applying lip balm will most likely help with this problem. The Nars pencils are much creamier, although this does mean that they don't last quite as long as the Maybelline ones. These also have great pigmentation and come in a variety of colours. The price tag for these is £19.00, £14.00 more than the Maybelline colour drama lip pencils. Despite the slight difference in texture, the Maybelline pencils could certainly be seen as a dupe for Nars. However, if you do have the money then I would opt for the Nars pencils just due to the nicer quality of the product.